peek >> << backNorthwest corner of Half and L, Feb. 2006. For more photos of 1015 Half, see the Expanded Archive. Aug. 20, 2016 - 1015 Half Street, five years after completion. 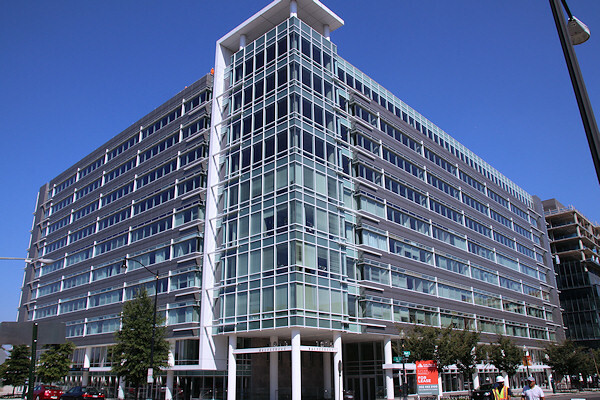 Construction began in early 2008, but stopped in May 2009, and in July Opus East filed for Chapter 7 liquidation, and work halted on 1015 Half. 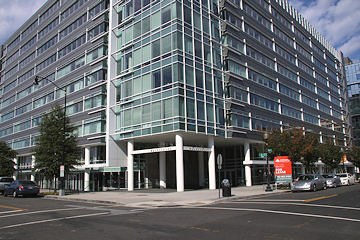 The next month, the Douglas Wilson Companies was named receiver for the property, and construction finally resumed in April 2010, with construction being completed in spring 2011. At far right is the 909 Half Street apartment building. October 16, 2016 - The same location, long after Nation bid farewell. Aug. 20, 2016 - Bonchon, a restaurant and bar featuring Korean fried chicken, opened in spring 2015 on the building's northeast corner at Half and K.
September 30, 2018 - The same location, with construction close to completed. 20 M Street is one block to the south, and you can also see Nationals Park in the distance (it's much more prominent in person). Oct. 19, 2014 - Sneaking a peek into the CBS Studio space, using a couple of bodies to shield the sun's reflection in the window. 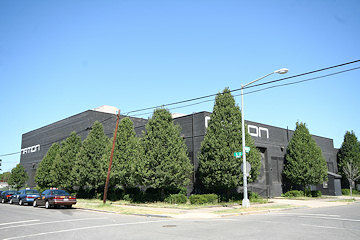 May 6, 2007 - The nightclub known as Nation (and previously the Capitol Ballroom) was demolished in May of 2007. May 6, 2007 - Looking eastward through the partially demolished nightclub. October 19, 2014 - The same location, long finished and soon home to CBS Radio. Velocity Condos has popped up one block to the east. November 2005 - Looking down South Capitol Street from the SE Freeway in November 2005. April 14, 2018 - The same location, with 1015 Half at center, visible for another year or so until 909 Half rises in front of it. The ballpark is visible at right. Not one of my photos, but a great zoom-in on a 1990s-era overhead photo showing the 1015 Half Street lot as it looked when it was still the J.E. Hurley Machine and Boiler Works site (see also a ground-level view of the building from around the same time). From the Carol M. Highsmith Archive, Library of Congress, Prints and Photographs Division.